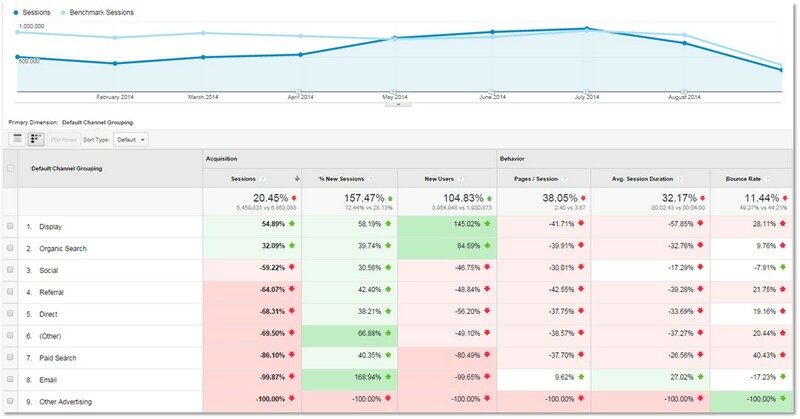 Benchmarking reports aren't really "new" to Google Analytics: They were part of the analytics interface from 2008 to 2011 before being phased out. Now they're back and promising to show site owners how they stack up against their competition. According to Google, "Analytics users can now compare their results to peers in their industry," using 1,600 industry verticals, 1,250 geographic markets and seven average site traffic options. The reports dig into acquisition and engagement metrics including traffic, average time on site, overall bounce rate, pages per visit and more. The traffic report looks at the type of channel that brought visitors to your site, such as organic search, direct, display, email and social media. The reports then display how your site positively (or negatively) matches up against the average of the other sites in that industry. Sounds great, right? Who doesn't want to see how they match up against their competition? But, not so fast. The reports began showing up for our clients, and we eagerly took a look. But the red flags went up quickly. There is a Travel Industry, and that certainly fits our clients. But there is no definition for what companies are included in the Travel Industry. Our clients are destination marketing organizations; comparing them against booking sites such as Expedia isn't apples to apples. What about hotels and resorts? They may be in the Travel vertical; but they don't really compare against, say, Southwest Airlines, also in the travel business. The Travel Industry Benchmarking traffic trends didn't follow any of the seasonality of traffic that our client sites received during the past several months. If these other Travel businesses don't deal with seasonality changes in traffic, are they even comparable to our clients? The traffic options for average daily visits to the site range from 0-100 to 100,000-plus. The default category is 10,000 to 100,000. That's a pretty broad spectrum, comparing sites that average 10,000-plus visits a day to sites that average 95,000-plus visits a day. Here’s how one client site that is a top performer in total traffic, overall engagement and conversions stacked up against the rest of the Travel Industry in the Benchmarking report for sites that average 10,000 to 100,000 visits per day (see below). Overall, our client site’s sessions (visits) were 20 percent lower than the rest of the Travel Industry Benchmarking report group. While our client outpaced the vertical in display advertising and organic search traffic sources, it fell behind in social media traffic, referral traffic, direct traffic and more. Our client outperformed the group in percentage of new sessions across all channels. However, that’s where the question of “What is the Travel Industry vertical include?” comes in. DMO sites typically have a high percentage of new visitors. This report would show that isn’t typical at all of the Travel group in the Benchmarking report. Finally, there's the issue that we at Miles have encountered when setting up benchmarking projects with DMOs from other companies: There are no analytics setup standards that must be followed to be included in the benchmarking. You don't know whether your site is being compared to sites that have their analytics implemented correctly, or if those sites are missing data, or double-counting data or worse. The aforementioned issues don't render these new Benchmarking reports obsolete, but they do need to be taken with the proverbial grain of salt. They can be helpful in terms of simply comparing your site to hundreds of other sites and seeing where your site ranks in terms of traffic types and engagement numbers overall and among certain regions. Twiddy.com, a vacation rental site, saw that it didn't compare well in the Travel Industry to others using email. The Benchmarking report led Twiddy.com's marketers to delve into their analytics to build an enewsletter campaign that produced record traffic and click-through rates. That's likely going to be the best feature of these reports – seeing a broad overview of how your site compares to hundreds of other maybe-similar sites. Seeing any disparities in the reports can be a good place to start to dig deeper into your analytics reports to see if there's an opportunity for you to take advantage of to increase traffic or improve engagement.